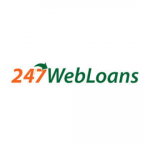 247WebLoans is a loan company that offers quick, online payday loans by matching customers with the best lenders from their large network of lenders. They promise to help you get a short-term loan from $100 to $1,000 that will help you until your next paycheck arrives. 247WebLoans is not a direct lender, but has one of the largest networks of lenders it works with, so the chance of getting matched with a reliable, trustworthy lender that meets your needs is quite high. Check out our 247WebLoans review and find out why it is one of the best companies of its kind. The way 247WebLoans works is actually very simple, even though the company is not a direct lender. In a way, it’s perhaps even better than a direct lender, as it offers you the choice of many different lenders and matches you with the best possible one for your particular situation and requirements. In order to get a loan through 247WebLoans, you first need to fill an online application form. The company will then match your information against their database of affiliates or lenders and come up with what they promise will be the best possible match. Their services are absolutely free, meaning you won’t have to pay anything to them directly. You will, of course, have to pay a fee to the lender you are matched with, but that is a whole different subject. 247WebLoans works primarily with payday loans and lenders specialized in this particular financial product. In case you are not exactly sure what a payday loan is, it is a short-term, small-dollar loan that you have to pay back when you receive a paycheck from your employer. Your payday is the due date for your loan and that’s when you are expected to repay your loan, plus fees. Rates and fees, as well as the amount of money you can borrow and some other details, do not depend on 247WebLoans but on the lender you are matched with. 247WebLoans cannot help you with that in any way, but they can and will list detailed information about your loan, obtained from the lender, once you get approved. When your loan request gets approved, you can, in most cases, expect the funds to be deposited into your account the following business day or within 24 hours. This may vary from lender to lender, but most loan companies work that way. Although different lenders may have different requirements, there are some general conditions you have to meet in order to get a loan. Those include being a US citizen, living in a state where payday loans are legal, being at least 18 years old and employed, and having an active bank account. 247WebLoans is highly committed to the security and safety of your personal information and uses procedures and techniques, such as encryption, to make sure your data does not leak or get stolen. Furthermore, they promise not to give any of your information to unaffiliated third parties. As we already mentioned earlier in our 247WebLoans review, the company works by matching you with a direct lender from their database of affiliated loan companies. In order to find a lender, you are supposed to fill out an online application form on the 247WebLoans website. The first step is to choose the amount of money you want to borrow and to specify your zip code. This is important because different states have different regulations and a lot depends on where you are located. 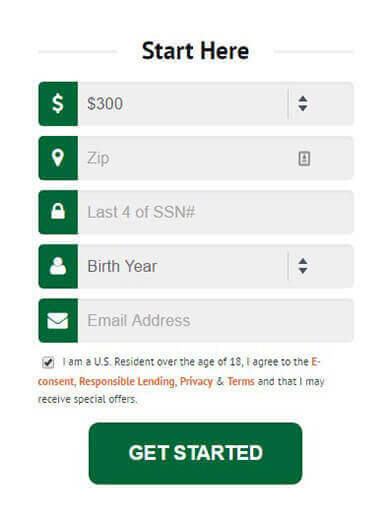 You will also have to provide the last four digits of your social security number and your email address, as well as the year you were born. After you have completed the application form, 247WebLoans will match your information with a lender. If you are eligible for a loan, and if there is a good match for you, the website will display the approved amount as well as terms, rates, and fees. As you could already learn from our 247WebLoans review, this company cannot provide any specific information about the terms and conditions of getting a loan and repaying it since those depend on the lender and may actually vary, but there are definitely some things that all lenders have in common and that you should count on. For instance, all payday loans are due the day you receive your next paycheck, which may be in 14, 15 or 16 days, depending on whether you paycheck arrives bi-weekly or once a month. Also, most lenders work by automatically withdrawing the amount of your loan, plus the fees, on your payday. This is an authorized process, of course, and in some cases you have to make an online repayment request. What happens if you are late or completely fail to repay your loan also depends on the lender. Some lenders allow the loan to roll over to the next loan term, but you still have to at least pay the fees; otherwise, your account will be considered delinquent. Also, if you skip several payments in a row, the lender may turn your account to a collection agency or another third-party entity. The lender may also take legal action against you. Again, exactly what kind of rates and fees or finance charges you can expect from your loan will depend on the lender you are matched with. However, the company does state that you can expect the fees to range from $15 to $35 for a $100 loan and a 14-day term, so that should be enough of a clue as to what you can expect. As for the APR, again, it will vary depending on many factors, but for a 14-day loan, it will most likely range from 200% to 2,500%. Just remember that APR is not your finance charge – the lender will inform you later on about that one. 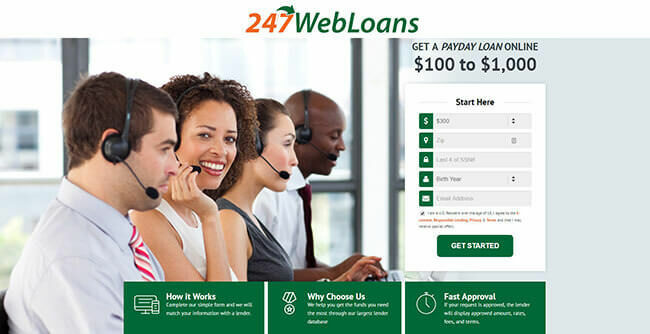 As you could gather from this 247WebLoans review, this is a company that might be very helpful in times of financial crisis, when you simply have to get a quick online payday loan to help you make it to your next paycheck. 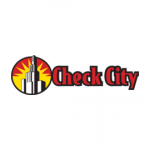 They work with an excellent and very wide network of lenders across the nation and they will most likely be able to match you with a perfect lender. There are some things to consider here, though: 247WebLoans is not a direct lender and as such it cannot provide any definitive information about important issues such as rates, fees, penalties, and so on. It will simply find a lender for you and connect you with them – after that, you are on your own. I wish they had at least some repayment guidelines on the site. Good service, but I didn’t realize it was a broker company until well into the process. I actually prefer working with loan companies that connect you to lenders because that way you get a better chance of getting a good loan at good terms. 247 web loans is an alright company if you need a very fast loan, but keep in mind that it comes with some very high rates and you really cannot afford not to pay it back on time. I once borrowed money through 247WebLoans and I was satisfied with their service. They are a very reliable, serious company, unlike some scammers I’ve dealt with in past. Instant loans are always risky but that’s life, you just gotta be careful. My experience with 247web loans was neither here nor there. They were okay, but there were some glitches with my application and everything was slower than I expected.